Richard G. Hall, Sergeant, Dee. 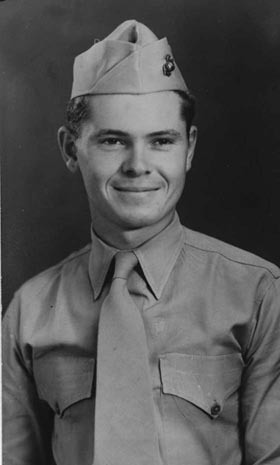 3, 1922, Kansas City, KS, and joined the USMC June 23, 1941. Military locations and stations: USS West Virginia, 5th Am. Corps, Corps Shore Party, CSP, Iwo. Memorable experience: being gunner on 5" 51 with his brother on December 7 and helped to remove wounded to a tug. Also helped salvage ammunition during the raising of the ship. Sgt. Hall was discharged Sept. 19, 1945. His awards include Letter of Commendation Regt. Level for Iwo Jima, Presidential Unit Citation, CSP. Earned BA degree in English from Rockhurst College, Kansas City, MO. and is employed as manpower rep. for Illinois State Employment Service. Married Lucia and they have one child. Richard's brother Harold also served aboard the USS West Virginia. They were both Pearl Harbor Survivors on the USS West Virginia.